So the Christmas cards are in the shops, the first TV ads starting to appear and awkward conversations about whose turn it is so host the big day are starting to happen. Without a doubt Internet shopping has made the whole experience of Christmas shopping a heck of a lot easier for those of us who work. Sometimes however an online experience can be the equivalent of leaving an overcrowded shop empty handed and in a huff such is the lack of usability on the site. Obstacles that exist in the real world e.g. not being able to find an item, crowded shelves, or worse, rude shop assistants, unclear price tags and poorly signposted cash desks all have their equivalents online. We decided to take a look at Firebox.com, a popular gift site to see how it fared in the run up to Christmas. Firebox sells a huge range of gadgets, toys and games for prices starting from under £5 to over £150. We asked some users to imagine they were buying a gift for a partner or friend for under £10. First impressions of the site were that it was very busy and overwhelming. 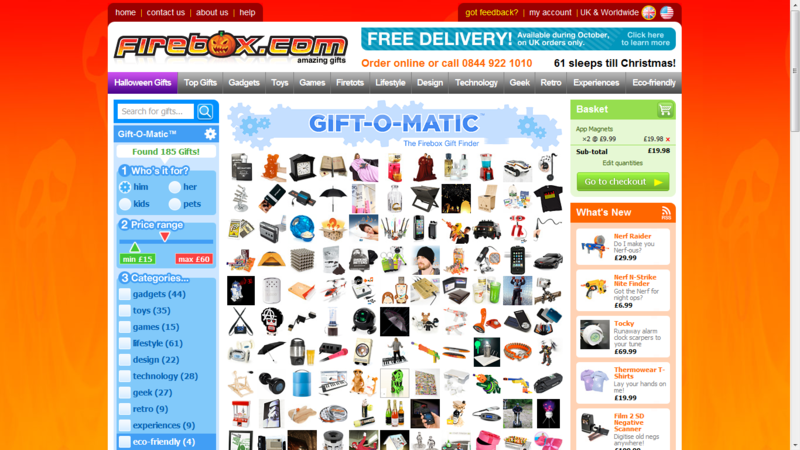 This may be a deliberate design on the part of Firebox as it does convey the wealth of items available for sale, but it does not help the user know where to start. However, with the competition only a click away the overwhelmed user may not hang around. There are several ways to narrow down the range of items available. As well as ‘Top 10’ and ‘What’s New’ lists, on the left there are price brackets and options for who you are buying for. Most of our users opted for a ‘Gift Finder’ option which lets you narrow by person, price and type of gift. This is another very busy page requiring some effort to sift through the items. The page shows small thumbnail images with item name and price available only when the user mouses over. This was annoying to some users who would have preferred to have that small amount of text in the page itself. The current design makes it impossible to quickly scan the page and mentally select or dismiss items. With such a wide range of stock this design simply adds more work to the purchase process. With the price limit of £10 the test users altered the price slider on the left to be a maximum of £10. What they found however was that this limit seemed to reset itself to £15 when they came back to this page after viewing the item details page. This caused confusion and annoyance with some believing it was a deliberate ploy on behalf of the retailer. Hopefully this is just a bug in the slider code rather than something more calculated but issues like this can erode the trust a user must have in an online retailer and should be avoided. On the home page, all the test users had noticed a banner stating delivery was free in October and remembered this when going through the purchase process. On the delivery options page however, the delivery type defaulted to ‘Standard’ delivery which was not free. Not all the users noticed this at first and so were confused as to why their total was more than they expected. This also caused annoyance with one users saying this was “sneaky” – another example of a simple design decision damaging the user’s trust. The site sells wide range of stock which is perhaps its greatest strength. It also provides, on the face of it, easy tools with which to narrow down the options. However when it comes to the actual usage of these tools there are clearly some serious flaws – in particular the unexpected behaviour in some features and options which could certainly put users off committing to a purchase and more importantly returning to the site in future. Keeping and converting current customers is always less costly than attracting new ones through marketing and advertising and this is a great example of how making a few very simple changes to the usability of the site could achieve this. A multivariate (A/B comparison) test between the current home page and an alternative simpler design to find out which option results in more sales would indicate the best design direction. Layout of product list pages (e.g. Gift Finder) should be improved in order to facilitate scanning and enable users to choose between options quickly. An alternative design to the Gift Finder page which displays text inline (instead of on hover as in current design) could also be tested in the same way as above. The possible bug which resets the price slider’s minimum price should be checked out and fixed. When free delivery is offered, use this as the default delivery option. Users will appreciate it. We posted a simple task on whatusersdo.com asking users to imagine they wanted to find a gift for a partner or friend under £10 and gave the firebox website address. We specified an age range of 18-35 and any gender. Each user’s session was recorded into an online video. We then inserted tags and notes at interesting points during the recording and made our conclusions. Thanks for this, very useful research. Just to confirm – the £10 max price jumping back to £15 was a bug and has now been fixed. Thanks for bringing these issues to our attention. We’re always interested to hear our customers feedback with regards to the website design, ease of use and the entire customer experience. We are continually redesigning and improving Firebox to help make the shopping experience easier for our customers. One of those changes is the navigation on the homepage – making sure our customers aren’t bombarded with information. Due to our extensive product range and diverse customer base, it is indeed important to enable all of our customers to find exactly what they want, quickly. Our Tech team have already ironed out the price slider bug you mentioned in your report. Thanks again for a detailed report.